Yomimono | Great writing from Japan and the world. Great writing from Japan and the world. Yomimono #16 – now available! Yomimono #16 features cover art created by Kyushu expat Michelle Zacharias. Of her work, the artist says that no preliminary sketches are made. “The artwork grows organically and then finally dictates when a piece is finished or not.” This is from a piece called “Celebration,” created with colored pencils, watercolors, and gesso on wood panels. This issue also includes writing by Nepalese filmmaker/writer Sushma Joshi, self-proclaimed “international party boy” Marcus Bird, poet and novelist David Galef, and others. Tomo: Friendship Through Fiction – An Anthology of Japan Teen Stories, will launch in jsut a couple of weeks. This book will benefit teen survivors of the March 11, 2011 triple disaster which claimed over 15,000 lives in northeastern Japan. This book includes stories and translations by several Yomimono contributors including Ann Tashi Slater, Leza Lowitz, Shogo Oketani, Toshiya Kamei, and Wendy Nelson Tokunaga. A bilingual evening of storytelling, creativity and outreach for Boston teens to support young people in Japan affected by and recovering from the March 2011 earthquake & tsunami disasters. Tomo, meaning “friend” in Japanese, is a collection of short stories and graphic art for readers age 12 and up, contributed by authors and artists from around the world, all of whom share a connection to Japan. Editor Holly Thompson (a Massachusetts native), Boston’s own Tak Toyoshima (“Secret Asian Man”) & other contributors will share their stories and help museum guests write or draw their own letters of support to teens in the hardest hit areas of Japan. An afternoon of storytelling, creativity and outreach for New York teens to support young people in Japan affected by and recovering from the March 2011 earthquake & tsunami disasters. readers age 12 and up, contributed by authors and artists from around the world, all of whom share a connection to Japan. Editor Holly Thompson, graphic artist Tak Toyoshima (“Secret Asian Man”) & other contributors will share their stories and help library patrons write or draw letters of support to teens in the hardest hit areas of Japan. 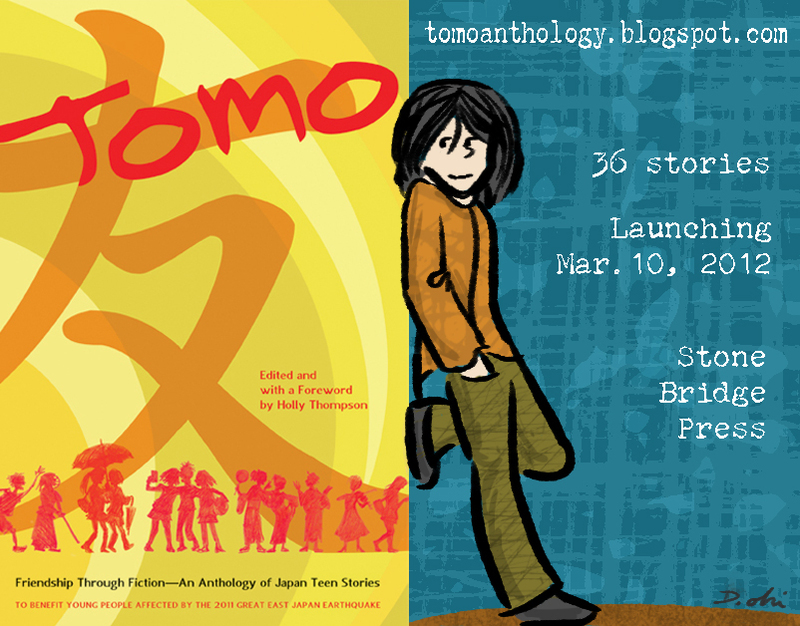 25 copies of Tomo: Friendship through Fiction– An Anthology of Japan Teen Stories will be given away. For the next month, all money generated from sales of Yomimono will go to the Japan Red Cross to help with the victims of the earthquake and tsunami. You can purchase copies here. Other efforts are underway to raise money in the literary and artistic community. You can read about some of them here. If you’re a writer looking for a way to help the victims of last week’s hurricane and tsunami, consider this. 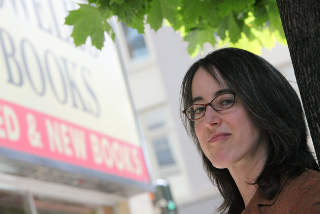 Marian Pierce’s short stories have been published in Portland Monthly, GQ magazine, The Japan Times, The Mississippi Review, Puerto del Sol, STORY, Scribner’s Best of the Fiction Workshops 1997, and other venues. She was shortlisted for the 2008 David Wong Fellowship at the University of East Anglia, for an author writing about the Far East. Her story “Tokyo Pleasureland” appears in Yomimono #15. In 2005 I spent 3 months in Tokyo doing research for a novel I have been working on, oh, forever! On an exceptionally hot August day, I took a break and went to Asakusa Kannon Temple. I sat down under a ginko tree next to an old man, and remarked in Japanese to him how hot it was. We started conversing, and he told me about his experiences during the firebombing of Tokyo. He also handed me a fan at one point, which is described in the story. The Swedish man in the story is based on someone who I talked to at the “Gaijin House” I was staying in in Saitama at the time. He was just as girl crazy as described! When I write by hand I lie on my couch, sit at my kitchen table, or sit cross legged on the floor or a patch of grass somewhere. When writing at my computer, I sit at little desk which faces a bulletin board filled with photos of friends and family. A novel about, in part, the crash of JAL Flight 123 in 1985. Under the Banyan Tree by R.K. Narayan. I love Narayan’s humor, the compassion that infuses his writing, and his deceptively simple style. That’s a hard one, but I absolutely loved Yakushima Island and the ancient Jomon sugi trees. Poet and former expat Judy Halebsky’s recently published collection, Sky = Empty, is reviewed in The Japan Times. Halebsky, who was awarded the 2009 New Issues Poetry Prize by judge Marvin Bell, contributed three new poems to Yomimono #15. An interview with Halebsky appears in Yomiono #14. Yomimono contributor Jane Joritz-Nakagawa’s fifth book of poems, incidental music is out with BlazeVOX and is available from Amazon. Whereas traditional poetics relied on meter and rhyme to create structure, the poems in incidental music use chains of association, sound, and logic to explore the form behind form. These cleverly wrought poems do what the greatest of poetry does — serve as objects of contemplation inviting the reader into a small universe both familiar and unfamiliar, knowable and unknowable. These poems challenge and thrill. Jane Joritz-Nakagawa’s incidental music presents an atonal surround sound of turbulent registers. In this work there is dissonance and friction at the level of figuration—a “welding of phenomenological scalpels”. These poems are filled with humans facing human conundrums. Joritz-Nakagawa’s lyrics emphatically convey that a wound is not a tomb—the tone is often solemn but also wry. “These are not full truths” — chaos threatens time and despair close to oblivion is unraveled in paradoxical lines, yet there is a bold confidence emitted, a pact is made to keep going. Amidst the rumble is an evanescence that can’t be collapsed into a flat plane. incidental music is attentive to the deep formal traditions of poetry in the western tradition: the sonnet, the pantoum, the cinquain, the rondeau, the triolet, the ghazal. And yet, as Jane Joritz-Nakagawa well knows, these traditions get their strength in how they intertwine with the contemporary. Incidental music is both innovative and inclusive of all that poetry can do.